Symptoms of ADHD tend to be first noticed at an early age, and may become more noticeable when a child's circumstances change, such as when they start school. Most cases are diagnosed in children between the ages of 6 and 12. The symptoms of ADHD usually improve with age, but many adults who are diagnosed with the condition at a young age will continue to experience problems. It's also a good idea to speak to your GP if you are an adult and you think you may have ADHD, but you were not diagnosed with the condition as a child. The exact cause of ADHD is unknown, but the condition has been shown to run in families, and research has identified a number of possible differences in the brains of people with ADHD compared to those who don't have the condition. smoking, alcohol or drug abuse during pregnancy. 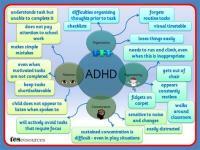 ADHD is the most common behavioural disorder in the UK. It's unknown exactly how many people have the condition, but most estimates suggest if affects around 2 - 5% of school-aged children and young people. 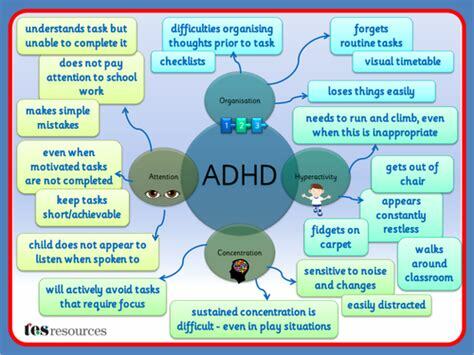 There is no cure for ADHD, but it can be managed with appropriate educational support, advice and support for parents and affected children, alongside medication, if necessary.